Register of Members Present: 108 members registered their attendance. Apologies: Stella Fogarty, Heather Hodgson, Marge Hemp, Jonathan Hemp, John Cartwright, Merle Chalton, Beryl Riley, Peter Welsh, Peter Steyn, Barbara Jones and Cheryl Leslie. Confirmation of Minutes: The Minutes of the AGM dated 9 March 2017 were accepted. Proposed by Vernon Head and seconded by Johan Schlebusch. Matters Arising: Grant Tarr queried whether the change in auditors had been confirmed at the 2016 AGM. It was confirmed that the appointment of the auditors had indeed been confirmed during the presentation and acceptance of the Treasurer’s report. There were no other matters arising. Chairperson’s Report: The Chairperson welcomed everyone to the 70th AGM of the CBC. With over 700 members the CBC is the second oldest and second biggest in South Africa. The chairperson also welcomed Mark Anderson, CEO of BLSA, who was the guest speaker for the evening. Before starting the Chairperson’s report Joy Fish, the club Treasurer was asked to update members on the theft of the club’s funds held in the corporate saver accounts. Joy Fish gave a detailed account of how her email was hacked and the hackers then used her email to give Quoin Wealth instruction, using Joy’s email address, on 5 different dates in Feb 2018 to transfer money into 2 different Nedbank accounts, stated to be CBC accounts but which were fraudulent accounts. The end result is that although the current account was unaffected the money from the Julie Te Groen and CBC corporate saver accounts were depleted with a loss of R500000. The case has been reported to the police and in addition both Quoin Wealth and Nedbank are investigating the fraud. In response to questions raised by members it was confirmed that Quoin Wealth is a Financial Planning and investment company who had invested the money in 2 Nedbank corporate saver accounts. It was also confirmed that Quoin Wealth did not phone Joy or anyone else to verify these transactions despite the very unusual high level of activities which had had very few withdrawals over the last 14 years. It was also noted that it was our understanding that money could only be transferred into the CBC current account. In discussing the way forward various options were highlighted but it was agreed that it was premature to act pending further communication from Quoin Wealth resulting from their internal investigation. A draft letter from the CBC to Quoin Wealth outlining our understanding and concerns was made available to members for comment prior to sending this to Quoin Wealth. In the meantime the Strandfontein conservation projects and the donation to the West Coast National Park have been put on hold. The club’s normal activities would however remain unaffected. The education pilot started at Floreat Primary school in Steenberg and plans to expand this to other schools in the area. A full report of the club’s conservation activities will be submitted to Promerops. Another highlight during 2017 was the new website developed under the co-ordination of Joy Fish with support from Gavin Lawson (who has carried the previous website on his own for many years!) and an enthusiastic team forming the website working group. The site has had more than 6 000 users who have cumulatively logged in just under 100 000 times. A special tribute was paid to Eric Barnes, Ione Vanderwalt, Rob Martin and Patrick Lockart who will be sadly missed by all and remembered for their outstanding contributions to birding over many years. 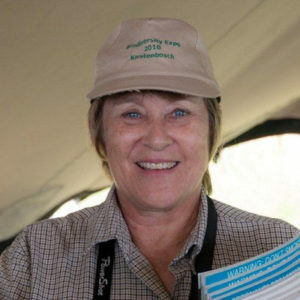 Priscilla noted that the club currently has about 70 people involved in some way – from all those high profile activities like editing Promerops, publishing the monthly newsletter, organising camps, courses, outings and guest speakers, etc to those who look after our physical comforts by ensuring we are supplied with refreshments. However she did encourage more members to volunteer their services to lighten the load of a few members who currently carrying about 75% of the work! Vernon Head was congratulated for his Eagle Owl award and Les Underhill for receiving the Gill Memorial Medal. The CBC Promerops awards were presented to Jo Hobbs and John Fincham for contribution to education and the environment in initiating and running the Paarl Bird Sanctuary project, Heather Howell for her contribution in teaching beginners about birding over many years both for U3A as well as the CBC and Patrick Riley for his ongoing technical support for the CBC at both evening meetings and at courses which he has carried virtually single handed in recent years. The adoption of the Chairperson’s report was proposed by Vernon Head and seconded by Johan Schlebusch. Treasurers Report: Joy Fish presented the Treasurers report. She also proposed that FastTrac be retained as auditors for the 2018 financial year. The report and auditor proposal was approved. Proposed by Tony Williams and seconded by John Fincham. Election of new committee. Priscilla Beeton, Johan Schlebusch, Dave Whitelaw, Joy Fish, Barbara Jones, Linda Merritt, Gillian Barnes and Melodie Hertslet had been nominated and accepted the nominations. The meeting unanimously approved the appointment of the nominated members to the CBC Committee for 2018. There was no further business and the meeting was declared closed at 9.30pm. Kirstenbosch Bird Walk – 20 February 2019 led by Otto Schmidt.